Smartphones on the Battlefield - Strike Fighter Consulting Inc. In most cases, technology on the battlefield is strictly designed, developed, tested and acquired with specific military applications in mind. 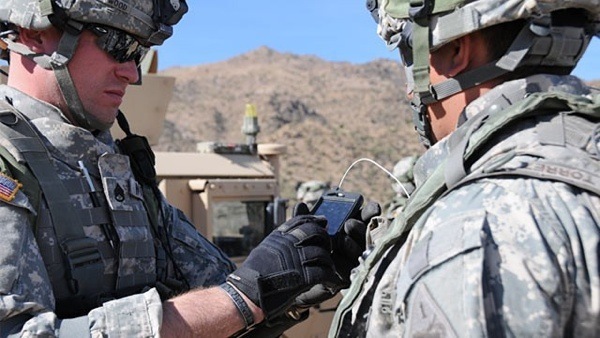 This is certainly not the case when it comes to smartphones on the battlefield as the military is piggybacking on existing commercial technology to provide the warfighter with a communication device that is suitable for the soldier. Today, soldiers are in Afghanistan with smartphones that not only provide GPS capability but also live feeds from UAVs and helicopters. Both the Gray Eagle UAV and the AH-64 Apache attack helicopter are equipped with a system called the Live Aerial ISR Link that provides connectivity to the soldier’s smartphones on the battlefield. Having a direct feed from the Gray Eagle or Apache of the battlefield provides a tremendous amount of situational awareness for the soldier and having threats located or terrain awareness is a significant advantage. The phones are part of the Nett Warrior system that is currently in use by the 4th Brigade, 10th Mountain Division. The Brigade was supplied with 2,700 Motorola Atrix smartphones that have the ruggedness required to withstand combat operations and are encrypted so they can take, send and receive pictures and videos. In addition, the smartphones can share location information and intelligence between a dismounted soldier and a battalion headquarters. The Nett Warrior program takes advantage of pre-existing commercial products and militarizes the smartphones to meet or exceed military requirements for battlefield operations. It’s expected that upon return from Afghanistan, the Army will destroy the Atrix smartphones and upgrade to a newer, faster version that has more options. The Army has purchased 3,700 Samsung Galaxy Note II smartphones for the next deployment and will continue to scrape the old and upgrade with the new as technology evolves. With commercial vendors racing to keep in front of the technology bow wave it’s refreshing to see the military finally embracing the commercial competitiveness that comes with aligning to civilian smartphones.